Under the terms of the armistice the German fleet is to be interned by the Allies. The U-boats have already sailed to Harwich in England and now today the German surface fleet sails to the Firth of Forth in Scotland, from there to travel on to the main British naval base at Scapa Flow in the Orkneys. 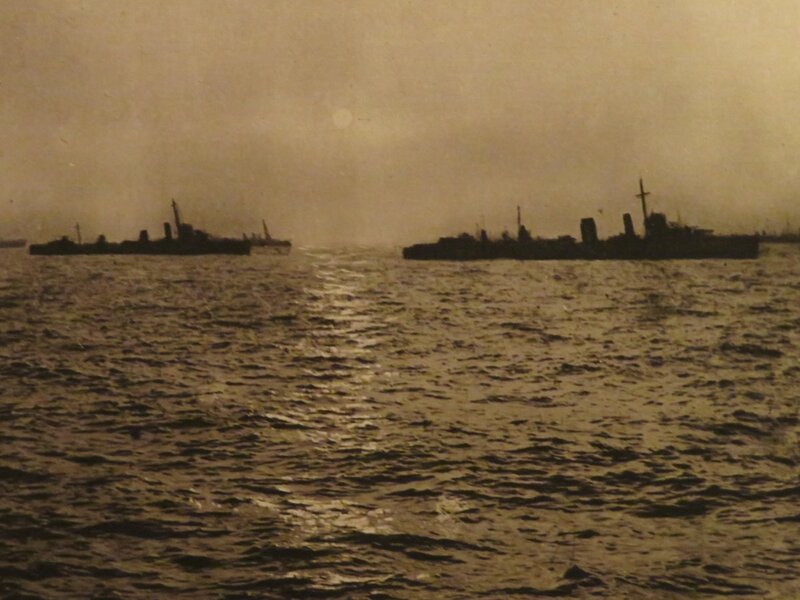 Unlike the U-boats, whose crews were returned to Germany, the surface ships will retain their German crews while they are in Scapa Flow; although effectively under British confinement they will not be prisoners-of-war as such and the sailors will remain under their own command. The German fleet sails under the command of Rear-Admiral Ludwig von Reuter; Admiral Hipper, the fleet’s commander-in-chief, delegated the distasteful task of leading the fleet into captivity. 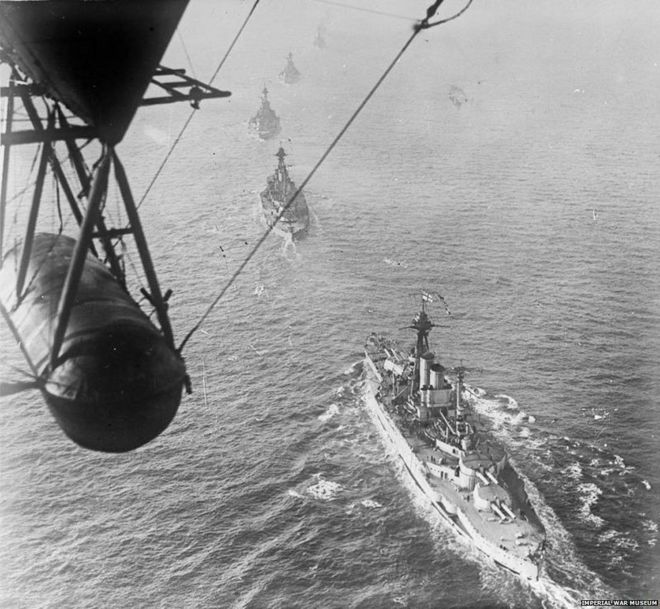 The German ships are escorted by the main British battle fleet, making this the largest gathering of warships the world has ever seen. 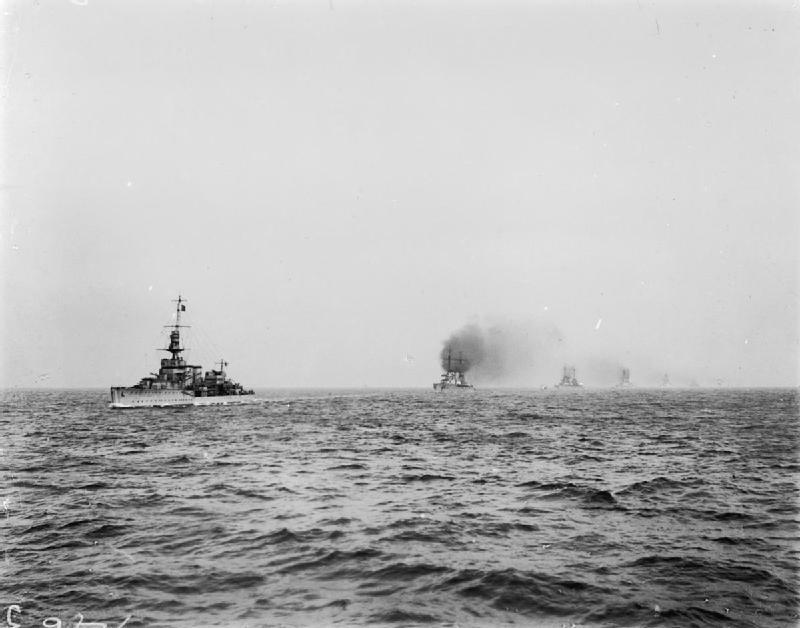 The two fleets clashed just once at the inconclusive Battle of Jutland in 1916 but since then the British navy has grown further in size and now it is joined by French and American warships, meaning that the Allies now have 23 battleships to the Germans’ nine and nine battlecruisers to the Germans’ five. The whole exercise is a spectacular show of strength by the British, with the German fleet sailing between two lines of Allied ships, either of which would be a match for them. The British fleet is commanded by Admiral David Beatty, who had commanded the battlecruisers at Jutland. His ships are prepared for any last minute tricks by the Germans: all guns are ready for action, with gun crews in place and ammunition ready to be loaded. But there is no need. The German navy knows it has been beaten and its sailors are not in the mood for suicidal gestures. Without a shot being fired the goal that eluded Beatty at Jutland is now being achieved: the neutralisation of the German fleet. President Wilson has stated that the Allies will not negotiate with an authoritarian Germany. To placate him the Germans have sacked Ludendorff and rewritten their constitution to sideline the Kaiser and transform Germany into a parliamentary democracy. Although Prince Max has been struck down by influenza, the Chancellor’s indisposition has not paralysed the German government. A note has been despatched to Wilson drawing attention to the constitutional changes and asking if now at last substantive negotiations for an armistice can begin. But not everyone in Germany wants an immediate end to the war. Ludendorff’s dismissal has neutered resistance within the army, but the leaders of Germany’s navy do not an armistice before they have had a last crack at the British fleet. Hipper, the fleet commander, and Scheer, the naval chief of staff, have made secret plans for the fleet to sail out and attack enemy shipping in the Channel. This will inevitably bring out the British fleet, leading to a final showdown between the two great navies. Of course, the German fleet is now much smaller than the British, so the battle will end with its destruction and the loss of thousands of lives, but honour of the German navy will have been restored. Preparations for this death ride are proceeding in secret but rumours begin to spread among the German fleet’s sailors. They are less keen on this suicidal mission. When word spreads through the fleet that tomorrow they will embark on their death ride, sailors on three of the battleships declare that they will not obey orders. Insubordination spreads, obliging the naval commanders to call off the mission. In an effort to contain the sailors’ unrest, they now order the dispersal of the ships with the most unruly crews to different bases. The ringleaders of the mutiny are also placed under arrest by loyal sailors. Fighting continues on the Western Front but it looks like the war will soon be coming to an end, unless of course Ludendorff succeeds in blocking the government’s armistice negotiations. The imminent peace is not an appealing prospect to the commanders of Germany’s navy. They feel that they have not played enough of a part in Germany’s war effort and that peace will leave them at a disadvantage compared to their comrades in the army. True, German U-boats have been attacking Allied shipping and there was a time last year when German leaders actually believed that the U-boats would force Britain to surrender. However the U-boat war failed and Prince Max has now ordered the submarines back to port. And the great battleships of the German navy have sat out the war, not venturing from port since the indecisive Battle of Jutland in 1916. The commanders of Germany’s navy now decide that the war cannot be allowed to end before the German fleet has fought one last battle with the British. Admiral Scheer has succeeded Holtzendorff as the navy’s chief of staff. Together with Admiral Hipper, the fleet commander, he works out a plan for the navy’s final battle. The battleships will sail out into the North Sea and down to the Channel, there to attack Allied shipping. The British fleet will certainly sail south to intercept the Germans but U-boats and minefields will deplete British numbers before the two fleets clash. The British fleet is now twice as large as the German. Under any realistic projection of the damage U-boats and mines will inflict, the British will still be strong enough to completely destroy the German fleet. Scheer’s plan has no chance of success and will cost thousands of lives, but it will restore the honour of the German fleet. Planning proceeds in conditions of the utmost secrecy. In just a few days the German fleet will set sail. The latest note from Washington to Berlin is stern. Wilson berates the Germans for the destruction their army is leaving behind in the territory it is evacuating. 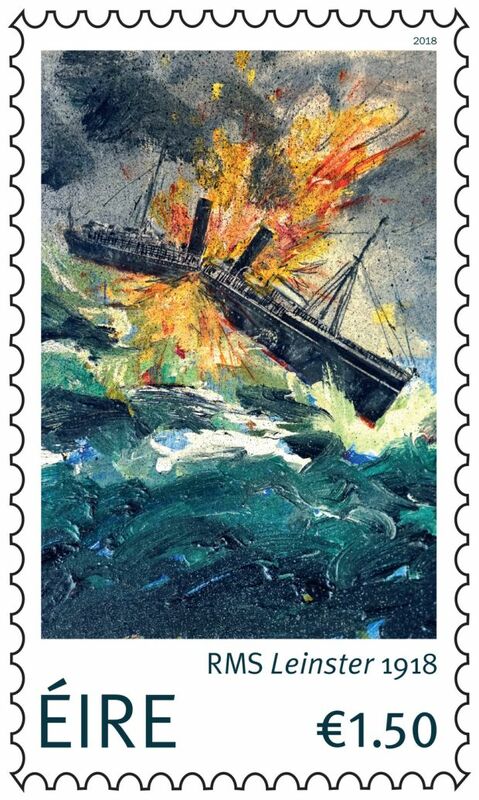 Angered by the sinking of the RMS Leinster he also demands an end to the U-boat campaign before an armistice could be agreed. And he suggests that Germany’s authoritarian system of government is itself an obstacle to a ceasefire. The Germans are peeved by the American note, feeling that it represents an insult to their army. Some, notably Ludendorff, argue that Germany must fight on and abandon any attempt to secure a shameful peace. But Prince Max, the Chancellor, knows that Germany’s ability to resist is ebbing away. Now he sends another note to Wilson. He protests against accusations of German inhumanity but as a concession he says that the U-boats are being ordered to return to port. He also claims that Germany’s government is being reformed to make it truly representative and that his cabinet is now responsible to the Reichstag. He therefore asks Wilson to let armistice negotiations proceed. The U-boat campaign failed to win the war for Germany; indeed, by bringing the United States into the war, the U-boats have brought defeat to Germany’s door. Yet the U-boat campaign continues, with the submarines attacking Allied shipping wherever they can. The adoption of convoys has made attacks on trans-Atlantic shipping difficult, so now the U-boats are more frequently targeting ships plying coastal routes between British ports or crossing between Britain and Ireland; ships making these short journeys tend not to travel in convoys, leaving them more vulnerable to submarine attack. The RMS Leinster travels backwards and forwards between Holyhead in Wales and Kingstown, just south of Dublin. As well as passengers, she carries post for the Royal Mail, a lucrative contract for her owners. But today, shortly after leaving Kingstown, the Leinster is spotted by the German submarine UB-123. Three torpedoes are fired. The first misses but the second and third hit, the last causing a huge explosion. The ship sinks quickly in heavy seas. There are survivors but 565 of the people onboard lose their lives. Many of these are military personnel but the dead also include civilian passengers and postal workers who were sorting the mail. In 1912 the Carpathia was sailing from New York to Fiume in the Adriatic when a wireless message alerted its crew to the shocking news that the Titanic had hit an iceberg and was sinking. The Carpathia raced to the scene and rescued the 700 survivors of the disaster. Today the Carpathia meets its own doom. Germany’s U-boat campaign has failed to bring Britain to its knees but the German submarines are continuing to attack Allied shipping. In response the British have arranged for ships to travel in convoys, so that they can be better protected by naval vessels. 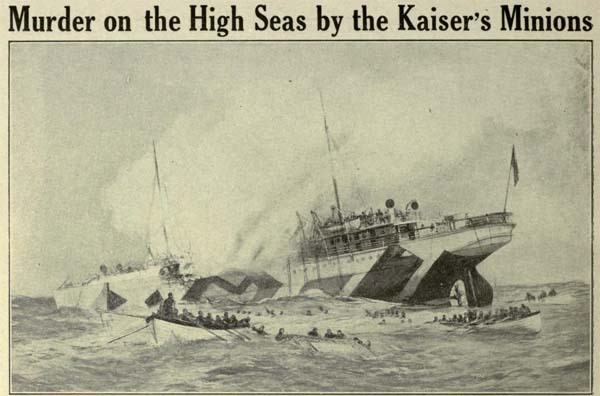 However travelling in a convoy does not make a ship invulnerable to attack, as the Carpathia discovers today when it is torpedoed by the U-55 while sailing from Britain to the United States. The ship sinks in under two hours. Unlike the Titanic, the Carpathia has an adequate number of lifeboats for the passengers and crew it is carrying. Almost all of these survive the sinking. The Allies are blockading the Strait of Otranto to restrict Austro-Hungarian U-boat access to the Mediterranean. Now Admiral Horthy, the commander of the Austro-Hungarian fleet, leads a powerful force out to attack the blockade. However, as the Austro-Hungarians move to their assembly positions at night in advance of their sortie, they find themselves under attack by Italian torpedo boats. This should be a one-sided battle, as one blast from the heavy guns of the Austro-Hungarian capital ships would blow the torpedo boats out of the water, but in the darkness confusion reigns. The Italian MAS 15 manages to hit the battleship Szent István with two torpedoes before making its escape. The Szent István sinks and Horthy, fearing that his attack plan has been rumbled, orders his ships to return to port.